I guess like most of us, I love watching cooking shows on TV. I just can't bare, however, to watch ones with a competitive element. OK, Come Dine With Me was good to begin with but quickly went off the rails, and I can spend some time with the Great British Bake Off. But Masterchef, for example, irks me beyond belief. Throw in a celebrity element and you've completely lost me. I'm much happier watching Nigel Slater wax lyrical about a fig, or better yet, repeats of The Two Fat Ladies with their brilliant theme tune, smothering each other in lard. As a result, I completely missed the Great British Menu, which combines both celebrity and competition. Simon Rogan was in the latest season (apparently) and if I'd watched the show I probably would have understood his oeuvre earlier, as I had his London restaurant Roganic figured all wrong. I mistakenly thought I was in for Hestonish culinary trickery. Instead, what I got was interesting food combinations sure, but also one of the most balanced and harmonious meals I've had the pleasure to enjoy. I think the best way to enjoy the charms of Roganic is to experience the 10 course tasting menu (£80). It might sound like a lot of food, but truthfully the portions are relatively small, as you'll see in the following photos, and the food is biased towards lighter flavours. In fact, there is only one red meat course in the ten. 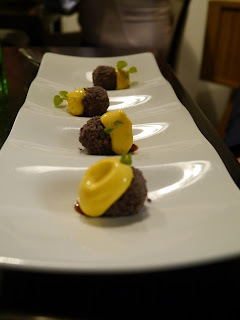 We started with two amuse: a warm pig's head cube and an umami-rich seaweed crisp which went nicely with the bottle of champagne we ordered to see us through most of the meal. The first of the ten courses was the textural and zingy "Grown-up yolk from the golden egg, salt, vinegar and garlic". The fun here is that it's not an egg at all, but chicken thighs cooked down to a mousse consistency before being coated in a golden yolky membrane. The crunchy puffed rice were flavoured with salt and vinegar while the dish was brought together by the garlicky foam. This dish hit so many right notes, it was difficult to keep up. The only thing I didn't like about it was the deep bowl in which it was served, which made it slightly difficult to eat. Dish two was "Keen's dumplings, cream of onion, sweet cicely and liquorice powder". The dumplings were bursting with Keen's Somerset cheddar and the plate was dotted with several varieties of roasted onions. This was earthy and nicely balanced and I loved the delicate smooth texture of the cheesey purée oozing from the delightful dumplings. Dish three is when things got more interesting: "Raw mackerel in coal oil, beetroot and apple". Here, thick slugs of the freshly picked fish were paired with the smoky coal oil, while some texture was created with the crunchy beetroot and soft apple jelly. This was a really interesting and great dish. The coal oil was subtle and more of a smokey scent than a flavour. I've said before that I'm not a huge fan of mackerel, but I've had three standout dishes with the fish this year thanks to The Ledbury and Nathan Outlaw. Then came the "Heritage Potatoes, fennel seeds, curds, cabbage and duck sweetbreads". This dish was farmy, rustic and earthy. The confit potatoes paired with the crunch of the cabbage and the light tang of the goat curd was inspired. Mr B cleaned the plate with some of the house-baked bread. This was the best course of the meal so far, which for a dish based around potatoes shows how great it was. Course 5: "Sugarsnax carrots with beef tongue, dill and buttermilk". This was an interesting cold dish, with the flavoursome sweet carrots still crunchy despite a gentle sous vide bath (70 degrees for 10-15 minutes depending on size, since you ask), while the dill sauce kept things fresh. The lightness of the buttermilk blob countered the rich pressed tongue cubes which added depth to the dish. Course 6: "Sea-dived scallop, dragon's egg, sorrel, barley and butternut". Here, a perfectly seared scallop half (I would have liked a whole one) was served under a salty barley crispbread and some grilled dragon's egg cucumber. The tart sorrel and sweet butternut were a nice compliment to the natural sweetness of the scallop. Not knowing much about the dragon's egg cucumber, the helpful staff brought up a couple of the creamy, egg-shaped fruits from the kitchen for us to have a look at. If you believe in dragons, you might even think you could hatch a couple of these. Course seven and we still haven't hit any meat! Instead we get "Plaice and leeks, cockles and sea sandwort". The fish is plancha-seared and served on a light leek sauce with chewy cockles and a baby leek. These were quite delicate flavours against the fairly dense, almost meaty, flesh of the plaice. Course 8: The only red meat course of the evening was "Reg's guinea hen, runners, girolles, salt-baked turnip and yarrow". I'm not sure who Reg is, but he produces a lovely bird. This was a beautiful combination of the bird's tender leg and breast and the earthy mushrooms. The bitter yarrow and sweetness of the roasted turnips balanced the dish, while the crunchy beans added some more texture. The delicate but rich combinations were autumn on a plate. Having finished the champagne, we drank a glass of an unusually robust Beaujolais with the hen. The wine list isn't enormous, by the way, but there is ample choice at reasonable price points with a handful of options by the glass too. So let's move onto dessert. Course 9: "Cumbrian stout in blackberry, liquorice and sea buckthorn". This was an amazing course and one of the best desserts I've eaten. The stout is transformed into a parfait which is then rolled in blackberry cake crumbs. The light liquorice sauce and the astringent sea buckthorn played with the sweet stout nugget. The different temperate and textural explosions of each mouthful were sensational. Course 10: Artichoke, butterscotch, wild plum and walnut. An artichoke for dessert? Here we had a slightly deconstructed walnut crumble, with gently poached plums atop a not-too-sweet butterscotch sauce and topped with artichoke ice cream. What a wonderful mix of flavours. A post dessert was served too. Douglas fir milkshake with a small gingerbread and carrot bite. I thought this was a refreshing way to finish the meal. I think one of the great things about Roganic is the use of interesting ingredients in imaginative ways, although it doesn't feel like a preachy experience. I've never eaten sea sandwort or buckthorn, let alone cicely or yarrow before. There's also an intimacy to eating at Roganic given the relatively small space and this is supported by the enthusiastic and passionate service. It suits Simon Rogan's cooking style too, which isn't flashy yet still makes quite an impact. The restaurant will be in the current location until mid 2013 before hopefully finding another local space. I keep coming back to words like balanced and harmonious when I think about my meal at Roganic. If food can evoke that sort of comfortable feeling, then something is being done right. I ate lunch by Simon Rogan today. Fantastic! I had to look up where Goosnargh is Kavey! It was a beautiful dish and a fantastic meal. 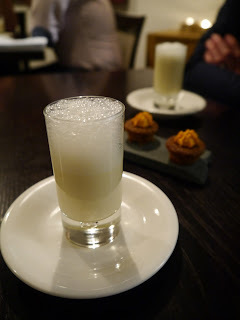 L'Enclume is definitely on my list of places to visit after eating at Roganic.